Sukkot is often refered to as “Z’man Simchateynu” – the time of our rejoicing. And one of the ways we can rejoice is by enhancing the beauty of the holiday. We call this custom Hiddur Mitzvah – the beautification of the mitzvah. When it comes to Sukkot, there are many ways to beautify the mitzvah – and some work as gifts to bring your dinner host, as well. A honey dish is a lovely addition to your Sukkah dinner table. The wishes for the sweet New Year carry through Sukkot. 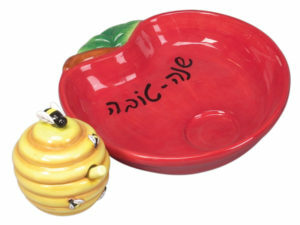 Honey dishes in the shape of a pomegranate or decorated with images of pomegranates have special meaning because pomegranates are said to have 613 seeds, corresponding to the 613 mitzvot. There are also honey dishes in the shape of apples or even beehives. Add a jar of honey and you’ve got gift for your dinner host. Who says holiday candles have to/be white? Beautiful Shabbat candles from Tzfat come in blue and white, purple and white, shades of green, pink… you name it. Add a decorative matchbox to complete your gift. Having company? 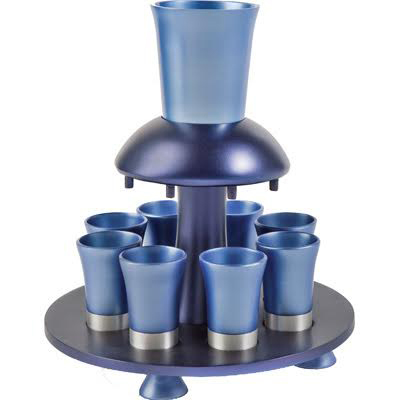 Consider adding a wine fountain to your dinner table – that is a large Kiddush cup that sits in the center of a tray on a pedestal, with smaller cups surrounding it on the tray, underneath spigots. As the wine is poured from the main cup, fills the individual ones. It’s an eye catching conversation piece that is also functional. Children in the house? There are two new books out from KarBen Publishing. Who’s Got The Etrog, is a cute illustrated story based on a folk tale of the Jews of Uganda. Simhat Torah is Coming is a rhyming board book in the Holiday is Coming Series. Finally, who doesn’t love new recipes? Treat yourself or a friend to a new cookbook. Kosher Taste by Amy Stopnicki is a lavishly illustrated collection of contemporary kosher recipes. 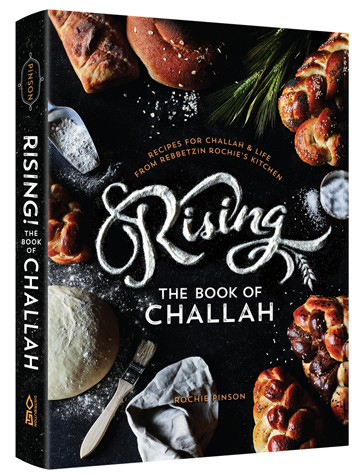 For something completely different, Rising: The Book of Challah by Rochie Pinson is for the serious bread maker (with challah recipes in infinite variations!). Something Sweet, by Miriam Pascal (Mesorah) has desserts of every kind, just in time for company. Marla Cohen is manager of The Judaica Store located at Bishop’s Corner in West Hartford (rivkajudaica.com).